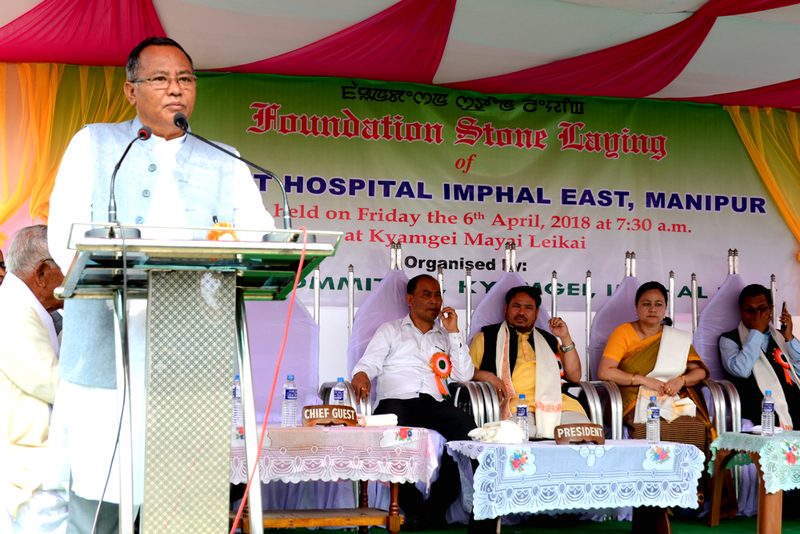 Manipur Health & Family Welfare Minister L Jayantakumar Singhon Friday laid the foundation stone for construction of Imphal East District Hospital at Kyamgei Mayai Leikai under Keirao Assembly constituency here. Speaking at the function Minister Jayantakumar said the people might not believe that a District Hospital would come up in the district but laying of foundation stone today has marked the surety of construction of the District Hospital in Imphal East which is first of its kind to be built in the district. To fulfil the desire to live long one needs to be health conscious and as suchApril 7is celebrated every year as World Health Day. The Minister further informed that the present government has been taking up steps to uplift the health standard of the people from time to time. Above the State Plans to provide better healthcare to the people of Manipur foreign nations has also been approached for construction of Multi-facility hospital, relating to which a foreign nation has approached the State Government to provide Rs 400 crores. Giving the presidential speech, Keirao MLA L Rameshwor Meetei said that Keirao is still lagging behind in every field comparing with other constituencies. “It will be privilege for the people especially in the Keirao when the District Hospital starts to function,” he said. He also appealed the public to cooperate with the Government initiatives which are being launched for the welfare of the people.